For the past few months I've been doing a lot of reading into mindfulness, which is typical me really, do a lot of reading and resarch, but then not so much putting things into practice. 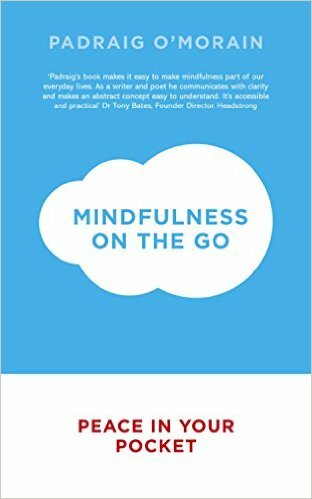 I've bought this very handy little book called Mindfulness on the go, by Padraig Moran, and so far it's been very eye opening. There are so many little moments each day, where you can just stop a moment and focus on what you are doing, or even just take a few breaths. I would reccommend it to any minfulness beginners, as it gives you easy tasks that you can incorporate into your life - no sitting in the lotus position for an hour at a time! So, what are the main benefits of mindfulness? It allows you to take a step back from yourself and observe what is going on around you and in your mind, without judgement. Ever been in a bad mood and not really know why? Mindfulness can help you understand yourself better and increase self awareness. It will probably come as no surprise to you that it can also improve mental wellbeing. Taken from the NHS UK website, "Studies have found that mindfulness programmes, where participants are taught mindfulness practices across a series of weeks, can bring about reductions in stress and improvements in mood." This reduction of stress is also very beneficial to physical health. It can also reduce pain in chronic pain sufferers, improve memory, creativity and attention span. All in all it's well worth doing, something that I need to gently remind myself of, without judgement of course! So for this week, I'm going to take a few exercises from my book, and do them each day, easy.